The filtration process for flavor and fragrance products is what achieves a high quality standard for clarity, color and stability. Blends of aromatic organic compounds can be composed of natural, nature identical and/or synthetic ingredients. These are concentrated through distillation, mechanical separation, or extraction before finally going through the filtration process to clarify and polish the product before packaging. The varying degrees of filtration demanded by flavors and fragrances are met by ErtelAlsop’s wide range of cellulose depth filter media and filtration equipment. ErtelAlsop depth filters and media succeed in filtering diverse natural and synthetic flavor aroma chemicals, essential oils, oleoresins, distillates, extracts and liquid compounds to assure the highest degree of quality. Flavor chemists formulate blends of materials to product extracts or liquid compounds. Depth filtration plays a critical role in the process to ensure the end product satisfies the customer. Particulate and Haze Reduction: ErtelAlsop Micro-Media depth filter media provides an ideal solution for reducing particulate loading in a wide variety of flavor products, effectively removing fine particulate that may collect over time at the bottom of product packaging. Essential Oil Absorption: ErtelAlsop 100% Cellulose Alpha-Media filter media is used in flavor extract applications to absorb free oil remaining in the extract after it is chilled and decanted. The cellulose depth matrix provides simultaneous particulate and haze reduction. Removal of insoluble waxes/lipids: Filtration ensures haze and wax residue will not be visible when the product is chilled or blended. Removal of microbial contaminants: Finer grades of depth media can remove microbial contaminants as well as byproducts of fermentation processes. Water Removal: Unwanted water contamination is sometime present in essential oils after extraction, either residual from the raw materials, or introduced in the manufacturing process. This water appears as a haze in the material, increasing the turbidity readings of the product. ErtelAlsop Zeta-Dri Pak Lenticular technology succeeds at removing water from essential oils during the filtration process. Both particulate and water can be removed in one pass through a Zeta-Dri Pak system. Expert perfumers in the fragrance industry draw from extensive palettes of essential oils and other fragrance materials. They scents they invent are enjoyed in a variety of products including fine fragrance, personal care, home care and home design products. The filtration of essential oils for fragrances removes haze, particulate, and possibly filter aids which were used in the refinement of these liquids. Particulate and Haze Reduction: ErtelAlsop’s Micro-Media filter media provides a trusted solution to the varying degrees of filtration required by fragrance producers. The blending of essential oils with alcohols, water and other base solvents can result in the formation of additional haze or precipitates in the final product. Filtration of chilled fragrances through depth filter media is the quickest, most consistent and cost efficient means of polishing these liquids prior to filling. Color correction: In some cases, color removal is essential for the presentation of a fragrance product. Micro-Clear filter media with activated carbon is the perfect solution for these filtration applications. The carbon impregnated filter media can be used in existing filtration equipment, removing the need to contaminate processing tanks with loose activated carbon. The process fluid can be recirculated through the filter media to achieve the required level of contact time with the activated carbon. Color correction and particulate removal can be achieved in one step. Vapor Control: An ErtelAlsop Vapor Master Enclosed Plate and Frame Filter Press or Lenticular Housing allows for the both containment of vapors and the treatment of liquid with filter aids. As with all ErtelAlsop presses, filter media is available for any application and/or operating condition, and can be tailored to your specific operating conditions. 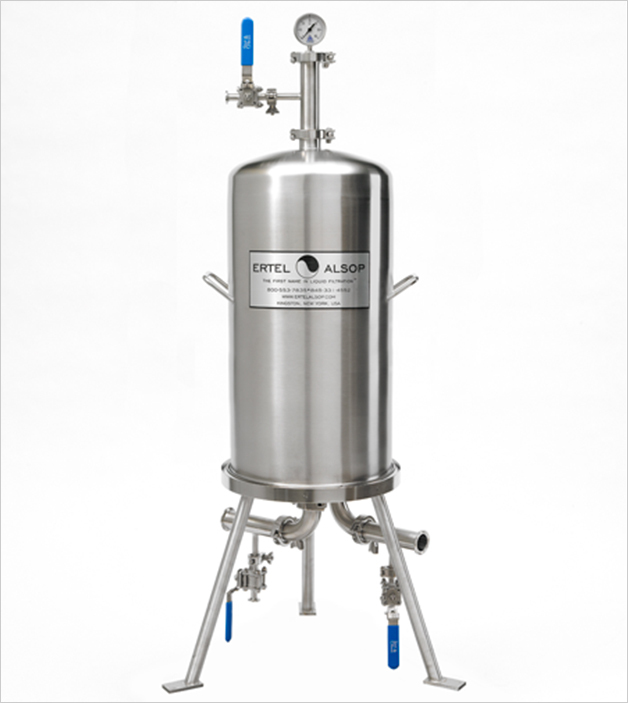 ErtelAlsop offers the widest varieties of filter media and construction techniques to provide good particle retention, clear filtrate, high flow rates, and dry filter cakes. ErtelAlsop Micro-Clear™ Activated Carbon Filter Mediais one of our most popular products used to eliminate or decrease undesired odors and colors. Activated carbon sheets with varying pore sizes and premium adsorptive qualities allowing the removal of excess color and odor from liquids without having to deal with carbon in loose form. MicroMedia XL Series, for purity, clarity, high throughout, and process control, featuring Celpure® diatomite. AlphaMedia G Series, the go-to premium filter medium for distilled spirits, wine, beer, fragrances and oils, the G Series is a mineral-free depth filter medium without inorganic components. It has a net positive charge zeta potential, allowing for highly efficient removal of particles smaller than the filter’s nominal rating. The large variety of configurations and options we provide enable lab-scale to production-scale processing, including processing multiple dies, liquid/solid separation through pressure filter, and handling high production capacities. 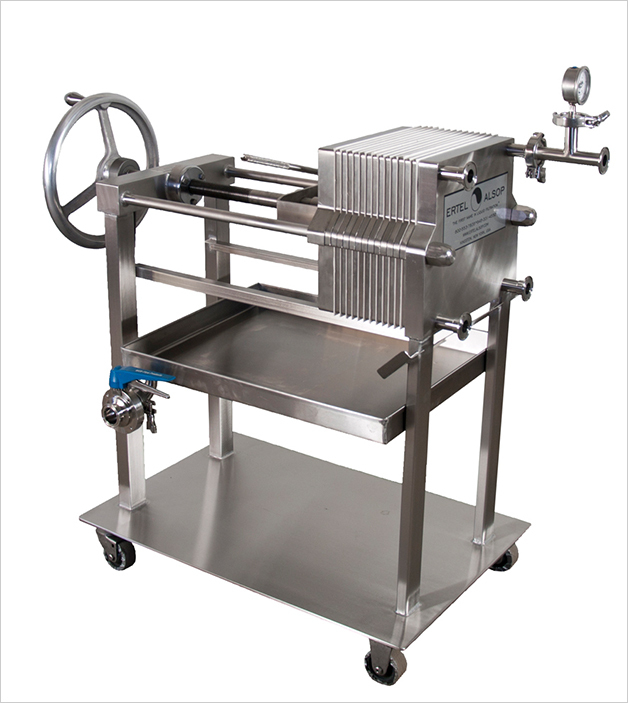 Our filter presses are a flexible and durable solution for the filtration of flavors and fragrances. The sanitary, fully stainless steel equipment is built to match the requirements of your application. The plate and frame design with a blanking plate allows for filtration of a wide range of batch sizes. ErtelAlsop filter press product line ranges from lab scale to commercial scale units, allowing for a smooth, linear industrialization process, with predictable performance at any scale from development to manufacturing. Our Pak Filter Housings are especially well-suited to filter volatile liquids like perfumes and fragrances. The housing is an enclosed system with a small footprint when compared to the large amount of filter area contained in each Pak Lenticular cartridge. The higher flow rates achieved in this style of depth filter, combined with the rapid media change out capability make it ideal for high-volume, low-solids polishing applications. Inventing filtration equipment since the 1930s, we’ve seen equipment come a long way. From our first lenticular cartridge format filter, to today’s modern evolution, every feature has been fine-tuned throughout ErtelAlsop’s lifetime to help you produce the best results. Product testing is always available either at your facility through our network of distributors, or at our in-house laboratory. Get personalized assistance to help you find what you need to enhance your process to produce quality in every batch.